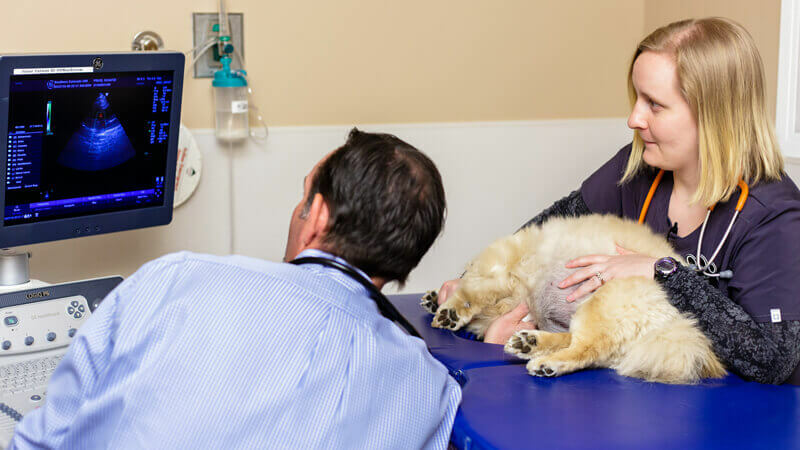 Veterinary ultrasound is a non-invasive procedure that allows two-dimensional visualization of the organ systems within the abdomen. It is more sensitive that radiographs which are two-dimensional by allowing visualization of the internal structures of the organs. Patients are usually given a close haircut and are positioned on their side or back for the duration of the procedure. During an ultrasound examination of the abdomen, we are looking for any architectural or anatomical changes to the organs, evidence of masses or tumors, enlarged lymph nodes, the presence of fluid or gas within the abdominal cavity, evidence of obstruction of tubular structures such as the common bile duct or ureters, stones within the urinary bladder or other parts of the renal system, and signs of changes within the organ systems that may be related to the development of disease processes. 1. Fine needle aspiration with cytology. This procedure involves inserting a needle into the area of interest and collecting a small sample that can be placed on a slide for microscopic evaluation by a board-certified pathologist. The procedure is safe and does not generally require sedation or anesthesia. 2. Cystocentesis of the urinary bladder for urine culture. This procedure involves inserting a needle into the urinary bladder to collect a sample of urine. This sample can be evaluated microscopically (urinalysis) or be cultured to evaluate for infection (culture). 3. Ultrasound-guided biopsy. This procedure is more involved than a fine needle aspirate. It requires evaluation of the bloods ability to clot normally prior to the procedure and general anesthesia during the procedure. Multiple core biopsy samples are collected and submitted to the pathologist for review and culture. We recommend that pets experiencing biopsy of the liver be hospitalized overnight. There is some risk associated with ultrasound-guided biopsy of the liver, including the risk of anesthesia and hemorrhage from the biopsy site. These risks are uncommon and this procedure is much less invasive than a surgical biopsy, as well as less expensive. 4. Abdominocentesis. This procedure is very simple and involves removing fluid that has accumulated in the abdominal cavity. In some instances, only a small volume of fluid is removed for diagnostic purposes. In other cases, larger volumes are removed to make your pet more comfortable. Samples are usually submitted for pathology review and culture.